Arg I think I’m just recovering from what you got, cus I seemed to get sick THE SAME DAY you did. Just hang in there! (^’.’^) I hope Kirby lifted your spirit. Oh, okay. That sounds better, ’cause if he stole it I don’t know what I’d do. My total faith in humanity would collapse and I’d go into a downward spiral of depression and eventually crash and burn killing myself. Probably by slitting my wrists several times, or hanging, or overdose on pills. Or maybe filling a tank with piranha, taking some sleeping pills, and jumping in just as they take effect. Personally, I think ALL money looks pretty funny. 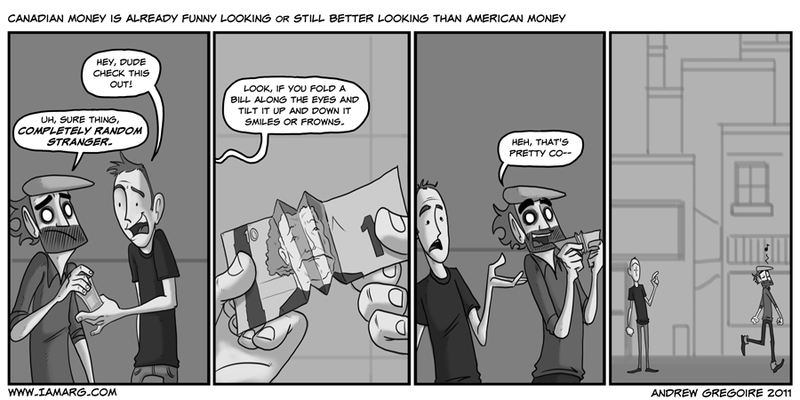 Love the last panel, also a question is canadian money paper (like americans) or is it plastic (like australians)? Canadian money is currently paper, except for out $100, which recently made the jump to semi-transparent plastic. Other bills are supposed to follow over the next while. Yeah, well I can make George Washington look like a green mushroom! Lets see your Canadese money do THAT! I miss Canadian Money. ): can’t do that with the pounds here. is there really a specific style of canadian humour? like how there’s british humour? I mean other than referencing “canadian” things is there something particularly canadian about the humour that makes it different to any other humour? just a thought…. They may be more colorful, but do Canadian bills have all the cult symbols and hidden messages American bills are famous for. I bleed green ink, so I’m a little bias. American currency is stupid because it’s so hard to tell apart the different values. Ps you can do this with any picture. Magazines are ripe fodder. Bigger heads is better, though. Take a stack of American bills and a stack of Canadian bills flip it on the side and estimate the amount each has… Its easier to guess the Canadian… When you open your wallet without even looking at the numbers you can easily tell how much you have. Personally, I prefer American currency, specifically for the reason that it is more uniform. It seems more, uh… professional? And I mean, I can flip through a stack in a second to estimate it. The usefulness of color identification seems moot point. Plus being color blind, I myself would probably only be able to identify two groups of color with Canadian money. For profound lack of a more adequate word. PS I’m definitely printing off a 10 note from google images and trying this out. The comic is good but I tink that cat stole your thunder. It made me pit milk in my office. And Spit. MY GOD! Typing and meds are a bad mix. I like euros, because they’re colorful in comparison to U.S. dollars..which are plain Green…..GREEEEEEEEEEEEEEEEEEEEEEEE–Anyway, I also find it’s less of a hassle to count change in euros. They’re simple, and also easier to pick up because they’re a bit thicker. Too bad I’ll be switching currencies pretty soon. Australian currency is the same. Colours all the way! A few years back I was in America. I went to Disneyland and I was buying something at one of their many gift shops. I accidentally whipped out an Australian $10 note (it’s blue and plastic) and the cashier said as if he was really funny, “Sorry we don’t accept Monopoly money.” Needless to say I got really cranky. The ignorance. Welcome to the USA: Leave the Monopoly money back home! I wish the US would start using polymer currency. It’s cheaper in the long run. For a long time I wondered why our famous presidents Lincoln and Washington were on the low denomination bills instead of the $50 or $100. Then I realized that since you probably have a lot of these lower bills, then you get to see their smug faces more often. Did Canada do the same thing with their leaders?